The West Santa Ana Branch corridor. Click above for a larger image. One of the Measure R projects that has received fairly little attention is the West Santa Ana Branch corridor. It’s an old Pacific Electric right-of-way that runs for 20 miles between Paramount and Santa Ana that is owned by Metro in Los Angeles County and OCTA in Orange County. The corridor cuts through 23 cities along its route. The AA will examine options for connecting to the Metro Blue Line, Metro Green Line, and Los Angeles Union Station on the north end, and to the Santa Ana Regional Transportation Center on the south end. Though alternatives will generally follow the PE ROW / West Santa Ana Branch corridor, potential alignment and improvement options outside the right-of-way may be studied. The AA will evaluate a broad range of alternatives, including bus rapid transit (BRT) with dedicated bus lanes, light rail transit (LRT), commuter rail, and high speed rail, along with “no-build” and Transportation Systems Management improvements. At the conclusion of the AA, SCAG staff will recommend a course of action to the Regional Council, as well as to Metro and OCTA. As the owners of the right-of-way and the implementing agencies, Metro and OCTA will have the option to proceed with the project into the environmental and engineering phases consistent with federal and state requirements. I think the most intriguing part of the above is a potential Green Line connection. As many of you know, the Green Line ends at the 105/605 junction — meaning it fails to connect to Metrolink’s Norwalk station. If a connection existed, Metrolink passengers could easily travel west on the Green Line. Instead they have to take a bus shuttle to the Green Line and attentive readers all know that More Transfers = Major Time Munch. It should also be noted that the project is on the list to be accelerated under the 30/10 Initiative. Under Measure R, the project is due to receive $240 million. More information can be found at http://pacificelectriccorridor.com/. It would be a real tragedy if that line, whatever it ends up being, ends at the Long Beach Blvd. station of the Green Line. It would cost more, but if the line ended in Watts at the Rosa Parks station you could connect directly to the Blue or the Green. Great idea to convert Santa Ana Red Car line to a light rail system. I’m sure many cities would chip in to build it. As a citizen, I certainly support it and appreciate the J O B S that will be created. I think the connection to Green Line is going to be problematic because of the 105 Freeway. A more realistic solution is a add a new Green Line station at Paramount Blvd, which will enable transfers to the West Santa Ana Branch. But that is still a transfer… albeit one that doesn’t require a 20 minute bus ride. The other thing that SCAG probably should take into account is that West Santa Ana branch ends right outside Downtown Santa Ana. Whatever mode (light rail, heavy rail, BRT etc) they decide, it needs to continue on surface street (Santa Ana Blvd) to the Santa Ana Metrolink Station. The lesson learned on the Green Line is that “last mile” connection is really important (i.e. to Norwalk Metrolink and LAX in the case of Green Line). It would be a huge mistake if we repeat this error again. Is there ANY desire or political will in Orange County to construct this? Would OCTA contribute any money to it? Would Metro have to pay for all of it? I am well aware that OC is all about roads, roads, roads, and a little bit for Metrolink. I recall the long drawn out failure of the “Center Line” light rail project. 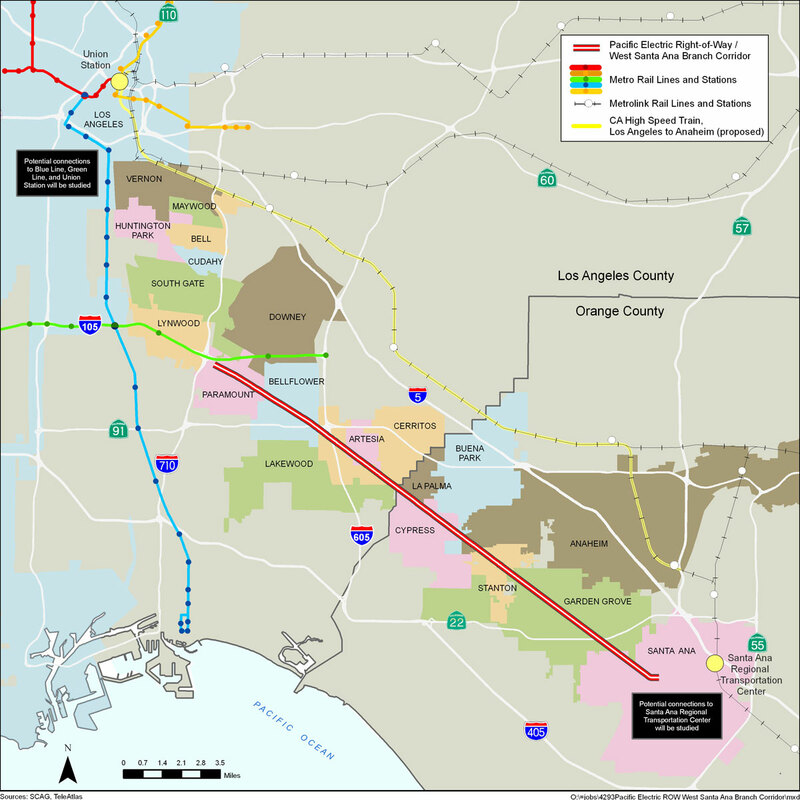 Connecting Metro Rail to the OC, with frequent headways, would be awesome, and would allow Orange County residents easy access to LAX (once the extension goes in there). Does ANYONE in Orange County have enough vision to see why this would be a great investment? I know of no dedicated “Bus Shuttle” between the I-105/I-605 station and the Norwalk/Santa Fe Springs-Metrolink Station. …but in my experience, these buses do not hold for late Metrolink trains (or the pair of Surfliners that also stop at the Norwalk/Santa Fe-Metrolink Station each day). Be careful. OC wants to use part of this right of way near the Southern terminus for a freeway off-ramp extension or something like that.